For years the electronics industry have been trying to make a “Smart Fridge”. In the early days these sort of just looked like a normal fridge with a tablet PC glued to the front. As you might guess, the usefulness of a tablet PC stuck to the front of your fridge is limited. You could listen to music, maybe watch a DVD, make a phone call on Skype, but essentially that would be it. The fridge was really not that smart at all, instead just a vessel for a laptop that you wouldn’t use to its full potential…because it was stuck to your fridge. Not the best working environment. The laptop/fridge soon disappeared from the market and recently the smart fridge has resurfaced. It looks like manufacturers have done a little more market research as the link between the fridge and it’s “computer” have come a long way. Smart fridges today can displaying information on what’s inside them, give feedback on nutrition and health, and interface with the rest of your household by controlling anything from heat to your choice on the stereo. Starting about 10 years ago Merloni Elettrodomestici in Italy came out with a refrigerator smart enough to keep track of what’s inside, store recipes and make your grocery list. Samsung’s Zipel Refridgerator has a console that connects up your television feed and controls your stereo using a user friendly interface. You can remove the 10 inch screen from the door and carry it wherever you like. I suppose it could bring a whole new meaning to eating in front of the television! 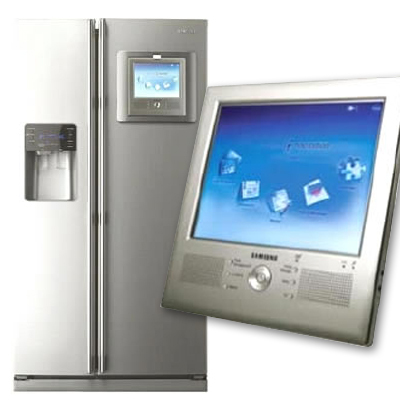 More recently, Whirlpool features a refrigerator that has a special Web tablet made by Qubit Technologies. The refrigerator scans items as they go in and out, keeping an inventory of what it contains. When a home runs out of certain groceries, the Qubit device can automatically order more from an online grocer and schedule a convenient delivery. Since the Qubit tablet can roam up to 200 feet from its base transmitter, users can check their refrigerator contents while sitting in the backyard. While the Whirlpool refrigerator won’t cook an omelet, it does have an integrated Web-browser to search for recipes that match the food items people have on hand. In case you have no idea how to make an omelet, you can prepare the meal by watching a celebrity chef on the Web pad. It almost makes me want to get one!